The form template is the master version of your form. Creating a template is the first thing that you must do before you can start using any other GoFormz functionality. The Template Editor is where you do this. To open a template in the editor, navigate to the Templates Tab and click the name of the template that you want to edit. You will see a Template Fields panel on the left, a Properties panel on the right, and the Template Builder area in the middle. Drag fields from the Template Fields panel into the Template Builder area. Position your fields where you want them within the Form and List Views of the Template Builder (resizing as necessary in the Form View); you can also delete fields that you no longer want in the form. Edit your field properties in the Properties panel on the right. In addition to this core functionality, the Template Editor lets you associate various attributes with your template. This includes automated events, print configurations, and a default form name. Most of this functionality is found within the Template Editor’s Header. Tap the pencil icon next to the form name to rename it. Additionally, the following actions are available in the header. Manage Events: Manage basic workflow automation events for this template. This includes creating new automation events, as well as editing/deleting existing ones. Save Changes: Save any changes you’ve made to the template. Note that this also relates to changes made through the gear menu. The text underneath the form name will read “You have unsaved changes” if there are any changes that need to be saved. Print Configs: Create custom print/PDF configurations for forms created using this template. Default Form Name: Change the default name given to forms created from this template. The name can be dynamically based on form fields. Custom Actions: Manage custom actions for this template. New Form: Create a new form from this template. Public Share: Allow external users to create forms based on this template. This is the main area of the Editor, where you build your form by dragging fields from the Template Fields panel into it. This really consists of two separate builders — the Form View Builder and List View Builder; you can toggle between these using the Form and List tabs at the top. See here for an explanation of Form View and List View. The Form View lays out your form fields just like a paper form would. To build it, just add form fields via drag-and-drop, and position them wherever you want in the Builder. You can resize your fields as needed, also using drag-and-drop. 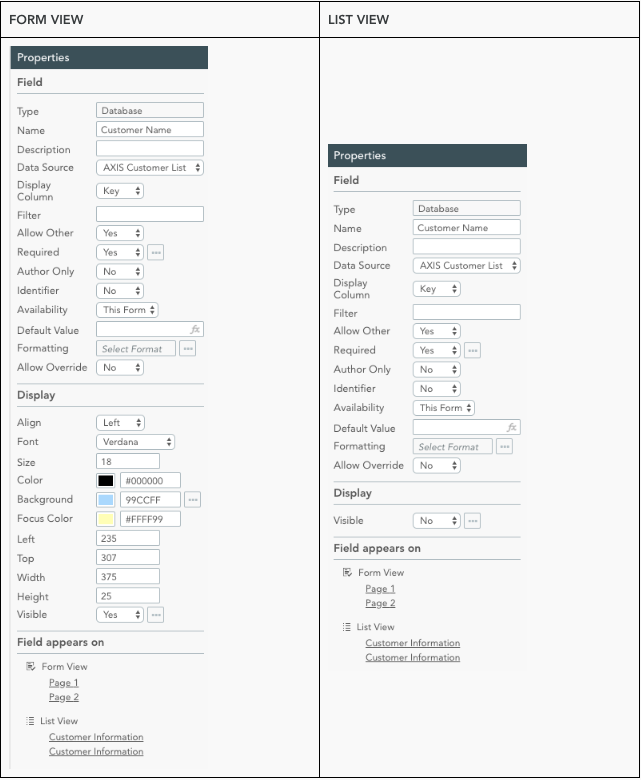 You will generally want to position your fields in a way that matches the paper form background that you uploaded. Use the Page Editor within the Builder to manage these background pages. The Form View Builder is a WYSIWIG editor — it shows an exact representation of what your Form View for this form will look like to the user across all GoFormz form editors, including the Web Form Editor, the Public Editor, and the Form View of the Mobile App Editors (iOS, Android and Windows). 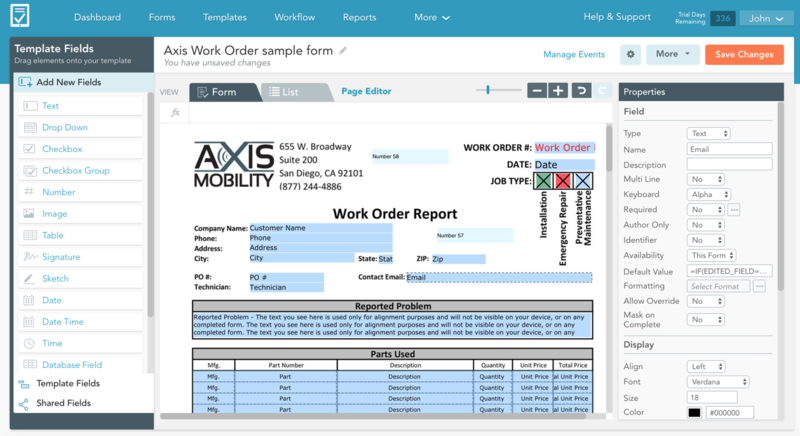 See here for details and best practices on building a Form View. The List View lays out your form like as a sequential list of standardized fields grouped into sections and tabs. The List View Builder lets you set up this framework via intuitive drag-and-drop actions. The List View Builder is not a WYSIWIG editor — it does not give an exact representation of what the form’s List View will look like in the mobile app. Instead, it is a logical representation of how the form fields will be ordered into sections and tabs in the List View. See here for details and best practices on how to build your List View. The Template Fields panel contains all the fields that you can add to your template. To add a new field to your template, simply drag the field name from the panel into the main Template Builder area. Each list contains a different set of fields, as follows. List Layout (List View only): This area contains a single Create Section element. Drag it into the List View Preview to create a new section. You can drag the element to a position within an existing section to split that section into two. See here for more on configuring the List View. Add New Fields: This area lists all available field types. Drag a field into the Builder area to create a new field of this type. See here for a detailed explanation of each field type. Field: This section contains properties that govern a field’s behavior and functionality, as well as field metadata. These properties are specific to a field across all locations — so if you have multiple instances of the same field in your form, all instances will share these properties, including instances across different views (Form View and List View). Display: This section contains properties that govern the field’s look-and-feel and layout in the Form View. These properties are specific to a field instance — each instance of a field will have its own Display properties. The List View has very limited Display properties because each field has a standard look-and-feel, while the Form View lets you do a lot more display customization. Field appears on: This section lists where in the Form View and/or List View the field is located. Click on a location to jump to it in the Builder. Columns (Table field only): This section lets you manage your table columns, including adding, reordering and deleting columns. Click a column name to view and edit its properties. See here for more on Table fields. In the image below, we see the properties of the same field in the Form View and List View. Notice that the Field and Field appears in sections are identical in the two views, while the Display section is different. To edit a property, simply click on it. Different properties will have different editing mechanisms — some will let you type in a new value, some will have a dropdown, some will open a color picker, etc. Notice the [. . .] next to a handful of properties. With one or two exceptions, this indicates that the property supports formulas or calculations. Click the [. . .], then click the Use a custom calculation option that appears — and the input control will turn into a formula text box, as seen below. Since formulas can sometimes get rather long, we provide a Formula Bar at the top of the Template Editor that lets you see the entire formula as you edit it. 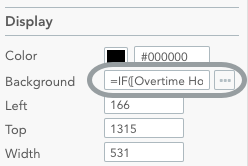 In this example, we change this field’s background color based on the value of the “Overtime Hours” field. See here for more on calculations. See here for an overview of all field properties.